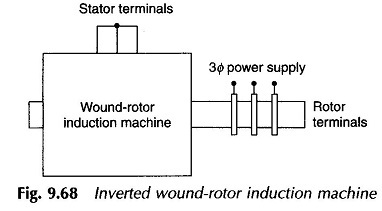 In a wound-rotor induction machine the three-phase supply can be given to the rotor windings through the slip rings and the stator terminals can be shorted (see Fig. 9.68). Such a rotor-fed induction machine is also called an inverted induction machine. The three-phase rotor current will generate a rotating field in the air gap, rotating at the synchronous speed with respect to rotor. If the rotor is kept stationary, this rotating field will also rotate in the air gap at the synchronous speed. Voltage and current will be induced in the stator windings and a torque will be developed. If the rotor is allowed to move, it will rotate as per the Lenz’s law, opposing the rotation of the rotating field decreasing the induced voltage in the stator winding. Thus, at a particular speed, the frequency of the stator circuit will correspond to the slip speed.